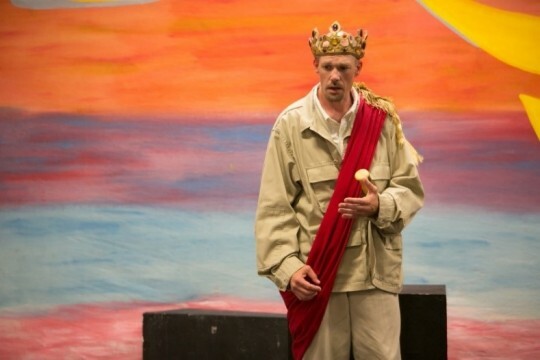 In this guest post, playwright and interim Artistic Director of Prison Performing Arts in St. Louis, Missouri Christopher Limber shares his experience producing Quick Brewed Macbeth at the Northeast Correctional Center, and the transformative power theater can have in a prison environment. Photos by blueShadow Photography. Theater has the power to change lives. This is particularly evident when producing theater in a prison environment. The nature of the venue encourages what many thrifty theater companies must always do—accomplish the impossible—with a tiny budget and devoted individuals. 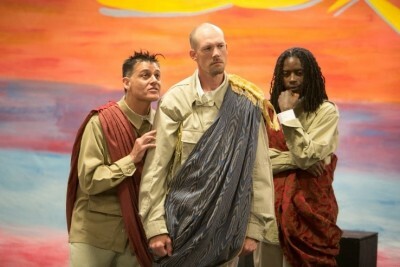 At the Northeast Correctional Center (NECC) in Bowling Green, Missouri, one of the three prisons I work in as Interim Artistic Director for St. Louis’ Prison Performing Arts (PPA), we gathered 30 interested inmates for a production of Quick Brewed Macbeth, a one-act adaptation of Shakespeare’s tragedy written by myself and co-writer Andrew Michael Neiman. A third of our workshop fellows were returning participants with experience doing plays, some had scattered experience back in school, and the rest were interested partakers, many of whom had never acted. This is the kind of group I love directing, for building an ensemble from a wide range of experience is in my teaching-artist wheelhouse. When it works, performing a play with a group you hardly know initially, is a life-changing process. Within prison, the greatest accomplishment of play-making is developing the skills and communication necessary to create an Ensemble. For inmates rehabilitating their lives, it can be profoundly transformative. Sharing a meaningful time of discovery, and realizing you have colleagues and a support system, can be a revelation to incarcerated men doing a play, often, for the very first time. For many prisoners, being able to give voice to your soul is liberating. Therefore, a theater process, where artistic risk is permissible and then, effectively, clearly communicated, is healing; and a building block for self-esteem and collaboration. Passion in prison has to be saved, indeed—monitored and quarantined by structure—into the humble process of rehabilitation. In a prosperous play, the embodiment and the generated energy of action and emotion is welcomed—placed consciously inside an environment where relational fireworks are essential and expected. Actors and audiences must agree to enter an imaginative world where permission is granted to be dangerous, brutal, treasonous and criminal; because actions are placed within the context of a crafted story which is safely staged to then ask the most important questions about our humanity. We are not hurt beyond the emotional moments of reaction to the well-constructed drama. Together, we are given encouragement to examine our potential for danger and vulnerability, and this often brings us as close as we ever feel to being connected to the world’s human family. Quick-Brewed treats the witches as the transitional voices who unfold the plot. They also knit the play together, busy throughout; popping in to prophesize, then eavesdropping, identifying time, place, and action, all the while delighting us with a taunting point of view in trochaic tetrameter. In the original production, Comédia half-masks identified the three weird sisters and were exchanged freely between five actors throughout the play. 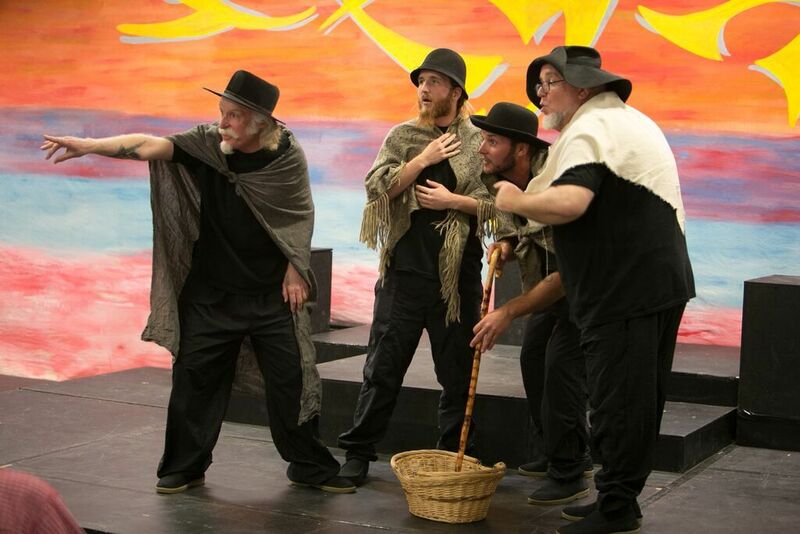 In one of those “Ah, Ha!” rehearsal moments we all realized: Shakespeare’s line, written around 1604, was intended to make his all-male, bearded actors, credible—and to wink at the audience. We figured the Globe’s young and clean-shaven apprentices were probably busy playing Malcolm, Donaldbain and Ladies Macbeth and Macduff, so a few of the older men were assigned the Weird Sisters. “Is this a dagger I see before me”. The emotional vulnerability brought on by Macbeth’s temptation, ambition, loss and regret were felt strongly by the cast. The first sessions of table work were filled with interrogations—about Lady Macbeth pushing her husband to murder the beloved King Duncan; Macbeth’s weakness and unquenched ambition; his dreams and greed; and, his addiction to the prophetic encouragement of those around him; all these circumstances were empathized with. The central question in the play resounded in every scene: “Do we decide to murder, commit treason or face an enemy we know might cause our own demise, or does the Universe?” Are lives determined only by human choices, or, are we fated—driven by mystical and divine forces beyond our control? Fate, fear, choice and regret permeated the air of our rehearsal space. With that we soon discovered a trio of Macbeths visually, theatrically, supported the inner life of our tragic protagonist—his questions and conflicts often stated in soliloquy and dialogue. This also gave us two more casting opportunities. Yero played the Questioning Macbeth, David, the Dark Macbeth and Shawn played the central, inner-tormented King, whose cacophonous turmoil of inside-the-mind questioning was placed literally on either side of him. Macbeth then walked into the final battle alone and almost peaceful—ready to accept either his fate or the human consequences of his action. In a prison, questions of choice and consequence have a profound resonance. In this setting, life’s most important ideas are pondered with an acute awareness of significance. This incarcerated cast with the silence of understanding, and the words of Shakespeare, realized their performances with a myriad of intricate and personal associations. Quick Brewed Macbeth offered a road for adding voice to discovery, and validation to the rigor and accomplishment of becoming an Ensemble. In a prison, a place where it is easy to feel alone, these attributes add this important residual to the triumph of making art. Christopher Limber is an award-winning playwright, composer, director and actor whose career has spanned over 35 years acting, directing and providing scripts, music and lyrics for theaters around the country, including The Kennedy Center in Washington DC, Childsplay Theatre in Phoenix, Arizona, the Idaho Theatre for Youth, and many St. Louis based theaters including The Repertory Theatre, Shakespeare Festival St. Louis, The Center for Contemporary Arts, The St. Louis Science Center, and Young Audiences Inc. For over a decade Mr. Limber served as Education Director for Shakespeare Festival St. Louis where he oversaw all touring productions, which reached more than 20,000 students each season. 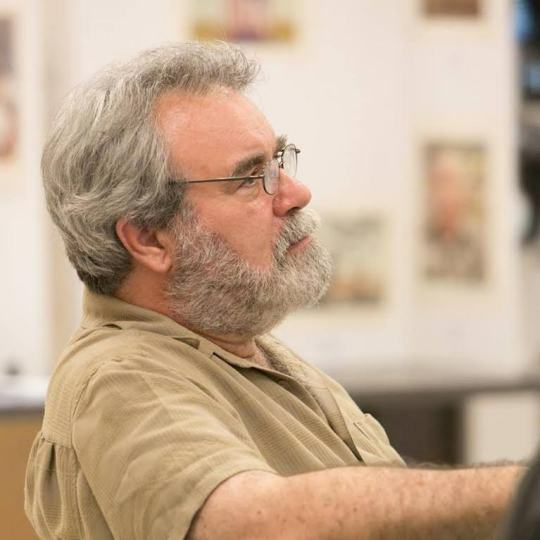 Two of his Playscripts, Inc. publications, Me & Richard 3 and Quick Brewed Macbeth, which he produced originally for the festival, won consecutive Kevin Kline Awards for Outstanding Production for Young Audiences in 2009 and 2010. 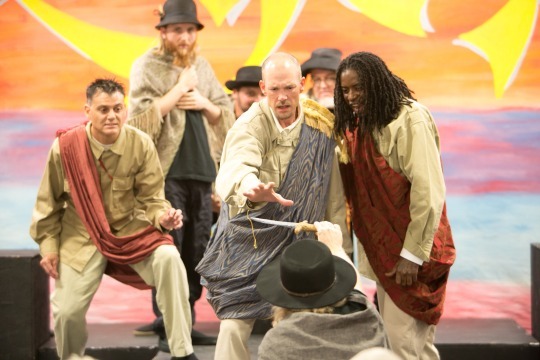 His most recent Shakespeare inspired work is Cruel to be Kind?, an original script inspired by As You Like It, which uses Shakespeare’s life in 1599 to illuminate the subject of bullying. This immensely popular production toured Missouri and Illinois for two seasons with an accompanying workshop, “Bullies and Boundaries,” reaching over 60,000 students. As a composer/Lyricist, Mr. Limber’s published scores include Kabuki Ugly Duckling and The Secret Garden, both collaborations with playwright Pamela Sterling. The Secret Garden won the Most Distinguished Play Award from The American Association of Theatre in Education. Read full bio. Prior to seeing the show, I could not believe that they could pull it off. The production was a triumph !! !